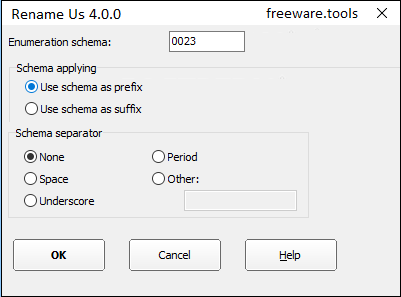 Rename Us is a free batch file renaming utility, which allows to rename or copy multiple files at once. When renaming or copying, the file names are changed according to the rules user specified in the project. User can add any number of different rules like enumeration, changing case of symbols, adding prefix or suffix, using file date, using MP3 tags etc. The rules are applied consequently in the order, specified in the project. Before renaming, the list of files can be rearranged manually or automatically by name, date, or type. The program is very useful when creating music play lists. Rename Us is a lightweight program which enables you to rename files in batch mode, by providing you with some standard tools. The interface of the application is plain. You can use the Explorer-based layout to locate and access files for processing. Plus, you can include subdirectories and read-only files. Preparing group of files to rename or copy is very simple. In embedded explorer, you can select files, filter them by mask, and then add selected or all files to the project file list. Once the list of files has been prepared, you specify actions to change the file names. These can be, for example, replacing substring in the file names, adding numbering, or even complex expressions. In the list you can view the location of each file. These items can be sorted according to the creation date, type, size, path, name and others. So, Rename Us allows you to rename files by using enumeration and expressions, changing the case, adding a prefix or suffix, and others. But you can also change the file extension. The items can be either copied or moved. Furthermore, you can enable the tool to create a log file and to overwrite existing files, save the current project, use a search function, move items up and down in the list, and others. The filename processing tool requires a small amount of system resources, has a good response time, supports keyboard shortcuts, quickly applies modifications and doesn't freeze, crash or pop up errors . There's also a well-drawn help file that you can look into. There's no limitations to the number of actions yo can perform. You can add as many actions as you wish; all the actions will be applied in the order you specify.